Election Day 2014: Kay Hagan, Carl DeMaio, and others face November Surprises. October Surprises Are Old News. Now They Happen in November. 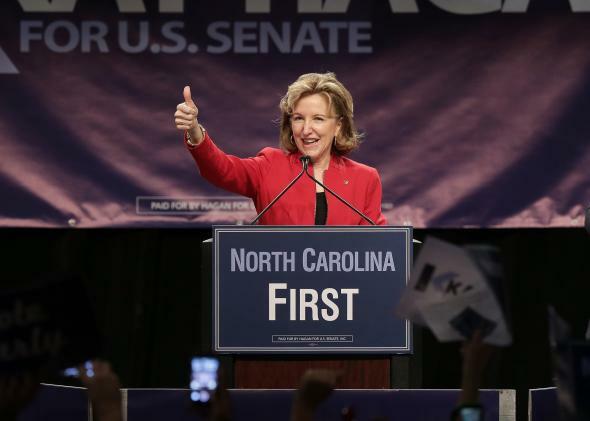 Sen. Kay Hagan speaks at a campaign rally on Oct. 25, 2014, in Charlotte, North Carolina. That was before the Charlotte Observer dropped a November Surprise on her. American democracy has a long and rich history of October Surprises—late-breaking, kooky, potentially game-changing stories that don’t occur until a few weeks before Election Day. Matt Lewis lined up a few examples at the Daily Beast, including Hurricane Sandy and that McCain volunteer who carved the letter B on her face. In Southern California, Carl DeMaio, an openly gay Republican running for a House seat, had a rough news cycle on the same day Hagan did. The short version is that a Navy veteran and former member of his campaign staff went public with accusations that the candidate exposed himself to him in a bathroom. The long version is here—and isn’t any better for DeMaio. In Iowa, a late-breaking Taylor Swift­–themed gaffe has put Democratic nominee Bruce Braley in an unenviable situation. BuzzFeed obtained video showing veteran Iowa Democratic Sen. Tom Harkin attacking Braley’s opponent, Republican Joni Ernst, by telling supporters that she “is really attractive” but that they shouldn’t care if she’s “as good-looking as Taylor Swift.” As a general rule, you don’t want to spend the final day of your Senate campaign explaining that your top surrogate isn’t a dopey sexist. “That’s not the only thing you stand for! Jesus Christ!” yelled the donor, millionaire businessman Leo Beserra. The donor vented more to the Guardian after Udall’s speech. It’s official: We’ve entered the era of the November Surprise. Election Day may offer a few more.